Sekonic created an OMR scanner that has a two in one system applicable for business, education and medicine because of its reliability, high performance, accuracy and ease of control. The new Sekonic SR350 Hybrid is designed to have twin-head sensors for photo reflector and contact image sensor (CIS) and other features to save cost and space for different purposes. The Sekonic SR-3500+Hybrid offers you all the robust capabilities of optical mark recognition (OMR) technology plus a wealth of expanded functions through image capture. The Sekonic SR-3500 Hybrid scanner accurately scans an OMR form for written pencil and pen marks (such as bubbles, check marks, tick marks) and bar codes, giving you the most precise and effective data available. This scanner also adds the power and flexibility of image capture. 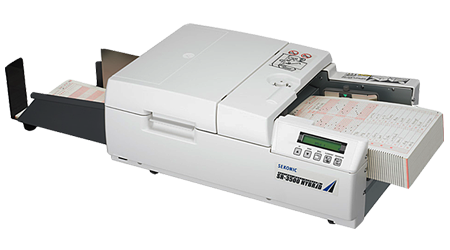 The Sekonic SR- 3500 Hybrid captures both full page images or image clips of text areas or text boxes, such as essay responses on a test or comment fields on a survey. This dynamic scanner can meet all your data collection needs today and in the future. •Readily share documents online with colleagues – such as tests to be graded by a group of teachers. This powerful feature eliminates the cumbersome task of photocopying, distributing, and collecting paper copies. •Create electronic archives for a paperless “paper trail”—a convenient and reliable alternative to paper records that can degrade over time. Reduce scanning time by scanning 60 pages per minute. Increase accuracy with automatic skew correction and automatic page flip for upside-down forms. Maximize usage with a scanner that supports all five types of Scantron forms, including 1, 2, 40, 48, and X. Decrease manual data entry with intelligent technology that recognizes checkmarks and "Xs" in bubbles, reads pencil and ink on the same page and tolerates stray marks in the timing track.